Laura Bashar, a.k.a. Family Spice, writes about food and her life as a wife and mom of three living in San Diego, CA. She started blogging as a mission to get families back at the dinner table. Laura shares recipes using fresh ingredients from all over the world, but especially likes to feature her Persian heritage, both in recipes and traditions. You can also find her on Twitter and Facebook. Snack time can be a toughie, I know. Especially with kids. My family loves nuts, and snack on a variety like pistachios, almonds and cashews. Bring on the veggie chips, too. 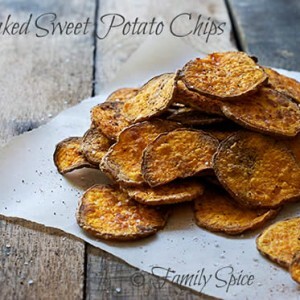 Alternative chips like sweet potato, kale and seaweed are great choices to replace that bag of cheese puffs.